We travelled lot with the kids when they were young. We were on a tight budget, so we mostly camped with a pop-up camper. We were able to travel to all of the 48 contiguous states at least once. Tom always tells of our eclectic tastes: we went to every national park and Hard Rock Cafe that we could. At the HRC Tom would get a traditional t-shirt, always black, until they quit making them in black. I got pins, mostly guitar pins. The girls got different things, whatever struck their fancy. Ben got a “city tee,” each with a unique picture representing the city. And he wore them a lot! When Ben was in college, he decided to make a quilt from these t-shirts: they were worn, underarm stains, some too small. He could have done it, but I knew I could do better. I convinced him to let me do it. I think I started it the year Junior refinished the playroom (changing to office) floor, because Linda helped me cut out muslin squares for backing. (About 2008?) I didn’t want to use fusible web, and something had to stabilize the knit fabric. I decided that all the squares should be the same size, so they were the size of the largest picture. Then it was back to school for another year. Each year at Ben’s birthday and in the summer I would do a little more. Then I would get sidetracked. Sewing or knitting for Evie or Ollie, painting exterior or interior of the house. Suddenly he was moving to Rochester for grad school. (Suddenly? After 6 years?) I decided I had to get it done. I dropped the idea of adding a wide border to make it bedspread size. I incorporated the small lapel symbols into a border. I tied rather than quilted. I made 2 pillows from the unused shirts. It was done in time for the move. 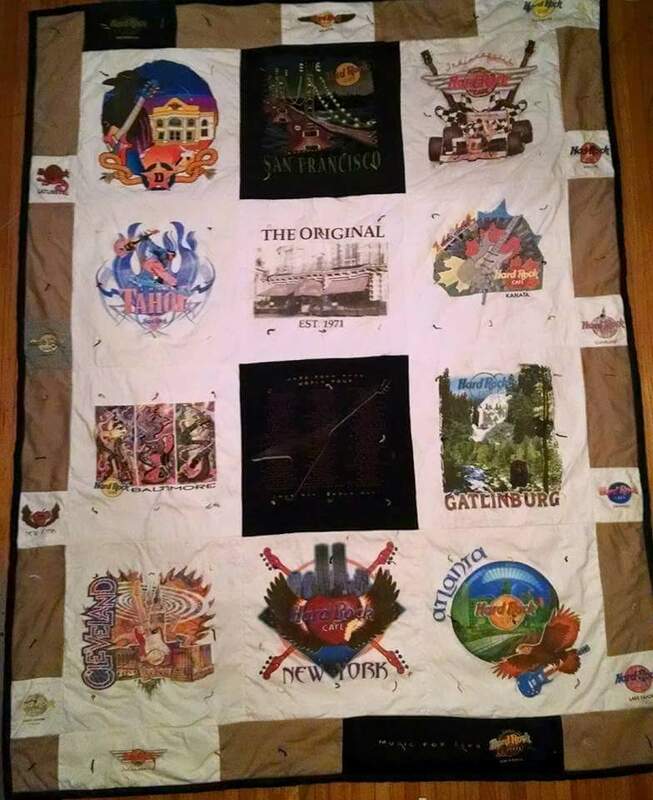 This entry was tagged family, Hard Rock Cafe, quilt, sewing, travel. Bookmark the permalink. If this makes you a terrible mother, then I am, too! My girls were in band, tennis, and several other activities where they got t-shirts. I saved them all, intending to make a quilt. I finally got my younger daughter’s quilt done last year (she graduated in ’05) and the older daughter’s shirts (she graduated in ’02) are still in the “works in progress” basket.